Arthritis is characterized as the inflammation of one or multiple joints. The most common symptoms of arthritis include pain and discomfort, swelling, inflammation, and stiffness, among others. Arthritis may affect any joint in the human body, however, it commonly develops in the knee. Knee arthritis can make everyday physical activities difficult. The most prevalent types of arthritis are osteoarthritis and rheumatoid arthritis, although there are well over 100 distinct forms of arthritis, affecting children and adults alike. While there is no cure for arthritis, many treatment approaches can help treat the symptoms of knee arthritis. Lifestyle modifications. Some lifestyle modifications can help protect the knee joint and impede the progress of arthritis. Minimizing physical activities which aggravate the condition, will put less strain on the knee. Losing weight may also help lessen stress and pressure on the knee joint, resulting in less painful symptoms and increased function. Chiropractic care and physical therapy. Chiropractic care utilizes full body chiropractic adjustments to carefully restore any spinal misalignments, or subluxations, which may be causing symptoms, including arthritis. The doctor may also recommend physical therapy to create an individualized exercise and physical activity program for each patient's needs. Specific exercises will help increase range of motion and endurance, as well as help strengthen the muscles in the lower extremities. Assistive devices. Using assistive devices, such as a cane, shock-absorbing shoes or inserts, or a brace or knee sleeve, can decrease painful symptoms. A brace helps with function and stability, and may be particularly useful if the arthritis is based on one side of the knee. There are two types of braces that are often used for knee arthritis: A "unloader" brace shifts weight from the affected section of the knee, while a "support" brace helps support the entire knee load. The healthcare professional may recommend surgical treatment if the patient's knee arthritis causes severe disability and only if the problem isn't relieved with non-surgical treatment. Like all surgeries, there are a few risks and complications with surgical treatment for knee arthritis. The doctor will discuss the possible problems with the patient. Arthroscopy. During arthroscopy, physicians use instruments and small incisions to diagnose and treat knee joint problems. 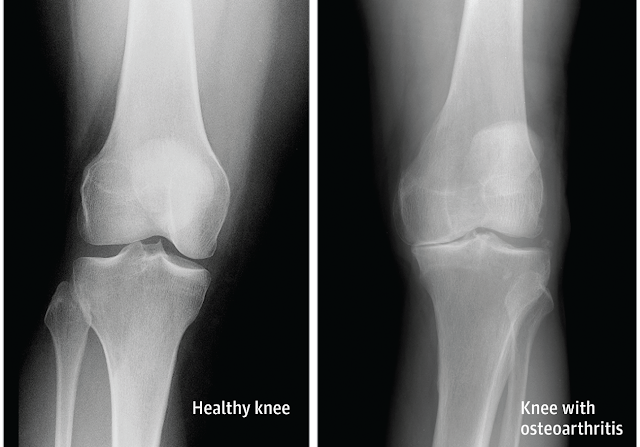 Arthroscopic surgery isn't frequently used in the treatment of arthritis of the knee. In cases where osteoarthritis is accompanied with a degenerative meniscal tear, arthroscopic surgery may be wise to treat the torn meniscus. Following any type of surgery for knee arthritis will involve a period of recovery. Recovery time and rehabilitation will depend on the type of surgery performed. It's essential to talk with your healthcare professional to determine the best treatment option for your knee arthritis. The scope of our information is limited to chiropractic and spinal health issues. To discuss the subject matter, please feel free to ask Dr. Jimenez or contact us at 915-850-0900 .